Plain and simple. I didn’t feel like revisiting the month of December for reasons listed below, and also didn’t feel like writing the post. THIS INTRO is the valuable part. Why was I hesitant/fearful to publish this? Why didn’t I want to write it? Why did I feel it lacked value? So what really happened in December? Revenues were down, as I didn’t quite hit the Blogger U pre-launch sales figure I wanted to (I expected 3-5 more buyers). Traffic was fine, though I didn’t work on this at all. Email list actually decreased, as I’ve had unsubscribes and haven’t focused on growth. Vacation was fun, but I feel guilty for not working. Podcast downloads DID increase (if you’ll remember from November’s report, this is something I wanted to have happen), so I’m thankful for that. But the bottom line is: It feels like I didn’t work during December. 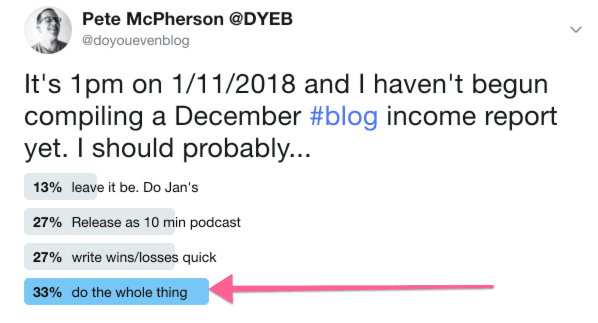 This is potentially embarrassing for somebody whose self-proclaimed purpose in life right now is to teach people blogging. I didn’t actually do a ton of blogging. Or if I did, it certainly didn’t manifest itself into a whole lot. This made me want to scrap the December income report in an attempt to ignore the problem, and distract myself with other work. No, publishing the post below is the hard part. I’m doing the hard part right now. What’s your hard part? Forget your blog. What don’t you want to do today? This week? What juicy, idealistic, opinionated thing do you want to say…but have been afraid to? What are you embarrassed to write about, even though you probably should? Or even if you’re responsible for? What’s the hard part of you’re blog right now, and how can you just get it done? Truth be told, I’m hoping the intro above will increase your loyalty to Do You Even Blog. Not even me, Pete, but the brand. The brand of helping bloggers push through blog mediocrity and come out on the other side not only alive, but thriving. Reaching people, despite the uncomfortable process. Teaching people with your failures, in addition to your successes. Now that I’ve explained the delay in this post, as well as lowered all expectations…let’s dig in. Did I reach my blogging goals last month? Honestly, my entire focus was on building out Blogger U curriculum, content planning, and trying to line up affiliates for that. In this case, I was successful. THIS was a pretty big win, as I’ve been really wanting to increase my podcast downloads lately, and expand my reach that way. I care way more about this than I do blog traffic right now. Private Facebook group = 160 members. I’ve been pretty selective in who I let in honestly. If they don’t actually answer the 2 easy questions I set forth, why on Earth would I want them in the group? I want to keep it small, tight-knit, healthy, and helpful. I like it the way it currently is lol. That’s why I’m limiting the group to 500 members max. Focus: GET B.U. content done! It’s so incredibly important. This might be the single biggest revenue driver for my business over the next 5 years. On top of that, I already have students eagerly awaiting the content. Honestly? Client work for other bloggers, and maybe some affiliate revenues. I do not care. Not my focus this month. Produce good content that changes people. First and foremost, nothing else I can do right now is as important or as effective as this….for the long run. BONUS: Mrs. Adventure Rich hosts the DYEB podcast, live from FinCon 2017! BONUS: “Do people want to read your stuff?” An unedited chat w/ Bobby Hoyt! How Nick True is Navigating from Full-Time Employee to Full-Time Blogger. Final thoughts on what worked and what didn’t. Blogger U content is seriously shaping up to be a game-changer for entrepreneurs and content creators. Proud of what it’s becoming. Also, I published some truly awesome interviews in December. In fact, there were no duds. Tanja, Nick, Bobby, Mrs. AR, ESI John…they all delivered and then some. I may or may not have tried (I didn’t). No growth = well, no goals. After Blogger U is up and running, I NEED to revisit growth for DYEB in order to meet my 2018 goals. Produce killer podcast content, produce Blogger U. Get it done so I can make a difference and return to a focus on growth. Do you publish your own monthly stats? Drop a link! Did I do ok reporting on December? What’s your theme for January, if you have one? 1. I don’t publish my stats. I do track them though so I can see how I’m doing but I don’t think they’re worth sharing at this point. 3. My theme for January is to crawl out from under my introverted rock and CONNECT more with other bloggers. PS – you still owe me a t-shirt! Dear Pete, great content indeed for December! You’re onto something – keep going – and you’re doing the right thing to think long term. Thanks Matthew. I appreciate the continued support as always. Here’s hoping to you (us) being right to stick with that thinking! Doesn’t always feel great in the short term. Dude, you released some great episodes in December. 2. Yes. Keep showing up. 3. Be intentional. My theme for the year actually. Don’t do anything just because. Do it with purpose. With that said, my traffic has been growing steadily so I am happy about that. But I have much, much more to do in terms of growing and developing my blog presence. 1) No, I don’t publish blogging stats! I don’t know if my readers would necessarily find that relevant but I should consider doing it at some point! 2) I LOVe your December report. This is probably the side of blogging people dont’ talk about enough. On Pinterest, all the widely circulated pins are how people are so successful in doing X-Y-Z but they didn’t get to that point without failing or missing their goals here and there. Thank you for painting a realistic goal for all of us bloggers. We need more of this! 3) My theme is to just get going for January. I am doing a lot of behind the scene stuff to set myself up for going full time in February… so there’s that! Heck yeah. Ramp it up. You can do it! Thanks for reading Jessica, and good luck in Feb! Love the honesty here. Even though you did not hit your goal, I certainly think you are on track. BU will take off once you have students showing success after attending it. It may take time but if it’s good, you will get here. No stats from me. I’ll update something quarterly to track progress against my goals. My avatar does not care about blogging stats so I don’t publish regular reports. Goals for January. Get started on fitness goal. Earn enough freelancing to fund my blog and educational goals this year. Keep blog running while working full time and freelancing. Love your speaking/writing/podcasting style. Have only skimmed one or two of your interviews, but your voice and style is easily top 5 in the industry. Keep it up! One thing that doesn’t make sense though, is why you’re so intent on working on Blogger U? 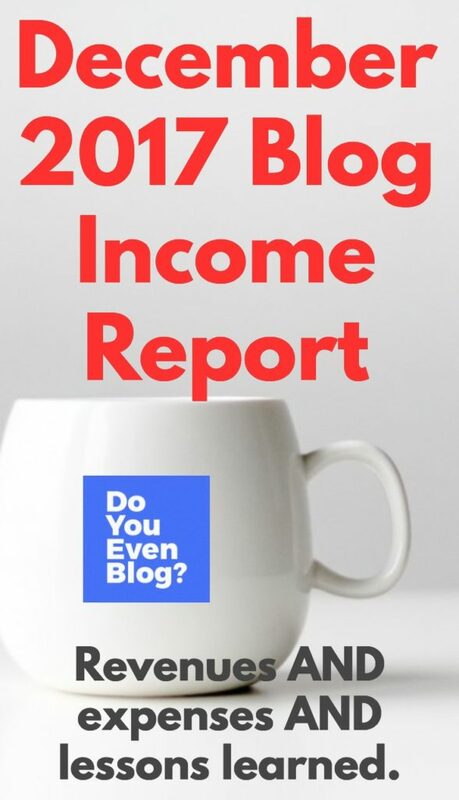 There are so many ways you can make money with this blog, jumping in to course creation, teaching others how to do, what you haven’t quite yet done with your own blog, is probably creating a disconnect subconsciously. It also doesn’t seem like you’ve created nearly enough content yet, to get the success you listed. Why not change how you get to your end goal and short term targets? For instance, (dammit this would be a shitload easier in a video!) if you want to sell a course (Blogger U), but aren’t quite there yet, one of the things you can do is lay the foundational content that would promote the course now. Then interview successful bloggers that have a similar course(s) you can promote as an affiliate that you trust. Later, when you’re further along and have had more time to perfect your own, you come back to that content and change how it’s monetized. It’s going to take time anyway, it hardly ever happens as fast as we want it to. In the meantime, you’re able to create revenue quicker, so you can grow the blog at the pace you’re talking about wanting. That said, you haven’t created nearly enough content, get crankin’! Yup. Great advice all-around Matt! I appreciate it. 5 – There’s a secret partnership I can’t announce yet. If there’s anything I can do to help you, let me know. Fun to watch your progression! I think you’re too hard on yourself, but I hear you. I feel like I should have worked more in December than I did, but it’s a fine balance with the holidays and family time. Thanks Monica! I appreciate that. I’m totally backing off on guest posts/interviews for a month or two as I finish the framework for BU (this is a long-term play, so getting the very first seed planted now). I don’t release income reports. Mostly because I’m lazy with accounting and do several months in batches instead of keeping it up to date. Thanks for sharing. It’s tough when you don’t meet your goals, but you gotta stay consistent. We’ve talked about it and you keep hitting that point on almost every episode. Excited for Blogger U to be released! My January goal is to finish my email course – 7 Days To Your Dream Vacation For Less. I’ve been hammered by bronchitis the last 2 weeks, so productivity has been almost nil besides bare necessities. But I need to focus and cross the finish line. Finish the couuuurrrssseee. Great goal. People can sometimes be there own worst critic. It can be helpful at times and not so helpful at other times. Like you, I’m placing a bigger emphasis on producing this year. You’re podcast has been AMAZING. It’s become one of my favorites. Keep chugging long! Growth is often weird in how it manifests. Dude, right? My growth the first 3 months was incredible, and I had dreamed of it continuing into months 4-12. Not so much lol. I’m excited to finish up the core content for BU and get back on the hustle train. Absolutely love your writing style and blunt voice! It cracks me up! I find it hard to post monthly blog reports as well if I don’t do as well as I’d hoped. But there is always someone out there who will find it helpful. I’m excited to follow your journey!